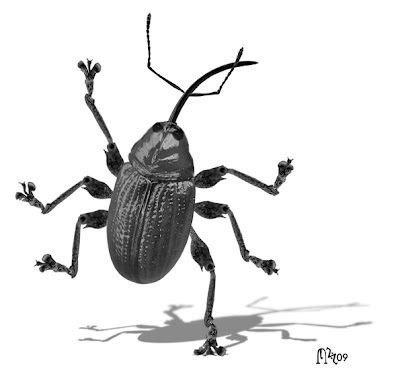 …but according to the Tholomartholomadic calendar, 2009 is the year of the Lesser walnut saboteur weevil. This farmer’s nuisance is distinguished from the Greater walnut saboteur weevil by its iridescent trochanters and smaller maxillary palps. Its secure place in the all-arthropod Tholomartholomadic zodiac stems from its abundance in northern Tholomartholomasia, its distinctive chirp, and the famous “Fable of the Lesser Walnut Saboteur Weevil and the Crippled Squab” — still a popular subject of Tholomartholomadic picto-strudels. From Constanelle’s Global Almanac, 2009 edition, p. xiv.